Syrian refugees walk toward a crossing point at Greece's border with Macedonia, near the Greek village of Idomeni, Sept. 8, 2015. U.S. Secretary of State John Kerry is set to discuss the annual U.S. refugee admission numbers with lawmakers and other officials Wednesday. His talks with House and Senate members will come at a time when the United States and other world powers are considering stepped-up efforts to help the thousands of Syrian refugees who have been pouring into Europe. State Department officials said Kerry; Anne Richard, assistant secretary for population, refugees and migration; and other officials would meet to present President Barack Obama’s refugee admissions proposal for fiscal 2016, which starts October 1. The State Department said officials also would discuss the agency’s efforts to address the ongoing refugee crisis in Europe. U.S. officials said the number of Syrian refugees resettled in the U.S. since the start of the country’s civil war would rise to about 1,800 by the end of the month. The United States resettled about 70,000 refugees from around the world this year. 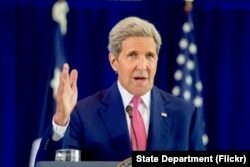 FILE - U.S. Secretary of State John Kerry. In terms of the U.S. response, Kirby said resettlement is just one option for Syrian refugees. “The people of that region need a home to go to,” he said. “Most of them want to go back home.” He added that what Syria needs most is a political transition. The United States has contributed more than $4 billion in assistance to help people affected by Syria’s civil war, as well as about $25 million to aid refugee resettlements in Europe. “But it does appear that this situation is worsening,” said Earnest, who said that was why the U.S. would consider additional measures. In Geneva, a U.N. official criticized the global response, saying too many countries want to offer financial aid for the refugee crisis but are unwilling to offer them places to live. “Buying your way out of this is not satisfactory,” said Peter Sutherland, the U.N. special representative on international migration. The International Organization for Migration said at least 2,760 migrants bound for Europe by sea have died this year, 500 more deaths than the same time last year. Some U.S. officials say the United States should increase its efforts to help Europe, which has been bearing the brunt of the refugee crisis. In a Tuesday speech, Senator Lindsey Graham of South Carolina, a Republican presidential candidate, urged the United States to take its “fair share” of Syrian refugees. Another presidential candidate, Republican Senator Marco Rubio of Florida, said he was “open” to the United States taking in additional refugees, but added he would want assurances they did not have ties to terrorist groups.